‘Catches win matches’ is a very popular quote that's widely used in the cricket fraternity. We have seen players like Jonty Rhodes being honoured with ‘Man of the match’ awards just for their brilliance in the field. Be it limited overs or Test cricket, a single dropped catch can turn the course of the game. On that note, let’s look at some instances where the batsmen capitalized on the reprieve, and went on to score double hundreds in ODIs. En route his imperious 219, fortune favoured the ‘Nawab of Najafgarh’ as the Windies captain dropped him on 170. Sehwag later said, "I was playing my shots throughout the innings, but started thinking about 200 in the batting powerplay, when Sammy dropped the catch. I thought God is with me." During the 2015 World Cup, Zimbabwe’s Tinashe Panyangara might have cursed himself after dropping the ‘Universe Boss’ Chris Gayle while he was batting on 27. The result was that Gayle went on to score the highest individual score in World Cups (which was later broken by Martin Guptill) – 215 off 147 balls (10x4, 16x6). In 2013, during his double ton against Australia, Rohit scored the first hundred off 114 balls. 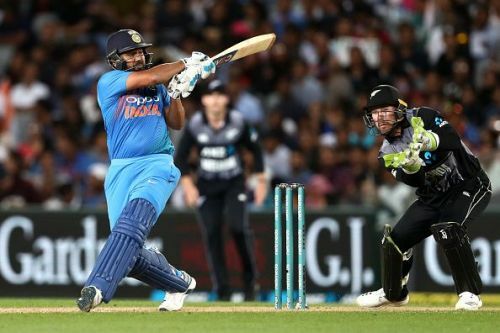 After the replacement fielder Moises Henriques dropped him on 120 in the 38th over, Rohit went in absolute hurricane mode, and ended up scoring 209 runs from 158 balls (12x4, 16x6). Little did Henriques know that he had not only dropped the catch, but also the game. In 2015 Martin Guptill became the first player to score a double hundred in a World Cup knockout match, and propelled New Zealand to the semi-finals. While batting on 4, he clipped a catch to square-leg, where Marlon Samuels dropped a fairly regulation chance. Guptill shifted gears post the 35 over mark, and went on to score 137 runs off off 52 balls during the final stretch. Guptill’s 163-ball 237 contained 24 fours and 11 massive sixes.